An artist’s impression of the new arch on the Fleur-de-Lys roundabout. The great Bard once wrote, “What’s in a name? That which we call a rose by any other name would smell as sweet”. 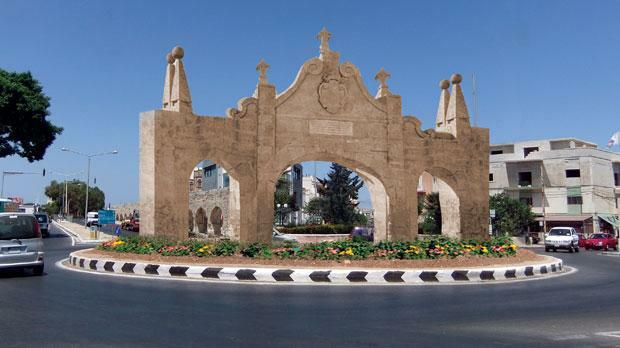 Not so for the Birkirkara and Santa Venera local councils that have been on a warpath for the past year over what to call the replica Wignacourt arch being built on the Fleur-de-Lys roundabout. A name which appeased both parties has been finally agreed upon, and it is quite a mouthful: The Wignacourt Arch Known As The Fleur-de-Lys Gate. Santa Venera mayor Stephen Sultana explained that the name “Wignacourt Arch” was mentioned in documents dating to the 1940s, when the original arch was struck by a Royal Air Force breakdown lorry in 1943, as well as by a Royal Army Service Corps truck a year later, which extensively damaged it. The triumphal three-door archway was built in 1615 as a tribute to Grand Master Aloph de Wignacourt, whose determination and funds helped complete the aqueduct in April 1615 to carry water supplies by gravity from the Rabat plateau to Valletta. Meanwhile, Birkirkara mayor Joanne Debono Grech said the arch had three carved fleur-de-lys and therefore should be known as the ‘Fleur-de-Lys Gate’. Conflicting reports had stated that an agreement was reached three weeks ago on the name ‘Aqueduct’s Arch’. However, the name agreed upon in court yesterday incorporates both ‘Wignacourt’ and ‘Fleur-de-Lys’. The Santa Venera council subsequently withdrew its request for an injunction to be issued against the Birkirkara council regarding the issue of whether the arch fell within Santa Venera’s jurisdiction. Ms Debono Grech said a part of the foundation of the original arch was located during the excavations and the architect in charge was deciding on the best way forward. The replica arch will cost an estimated €280,000; €100,000 of which is being funded by Bank of Valletta, a sum which had been pledged when the planning authority gave the green light for the bank to build its headquarters in the area.